The truth of the matter is that many of us don’t look at the roofs of our homes too often. How often do we really inspect our roofs? It is better to detect the problem early in the process if there are any neglects or snags. In fact, problems neglected can lead to costly repairs. Damage can spread to insulation, roof boards, walls and the interior. Depending of the weather, most homeowners feel they can get away with a roofing inspection once a year. However, what if the weather conditions were to be extreme. It is always prudent to inspect the roof after any immense wind storms or a severe freezing spell. Strong wind storms can have a serious effect on shingles; freezing water can cause damage to flashings. 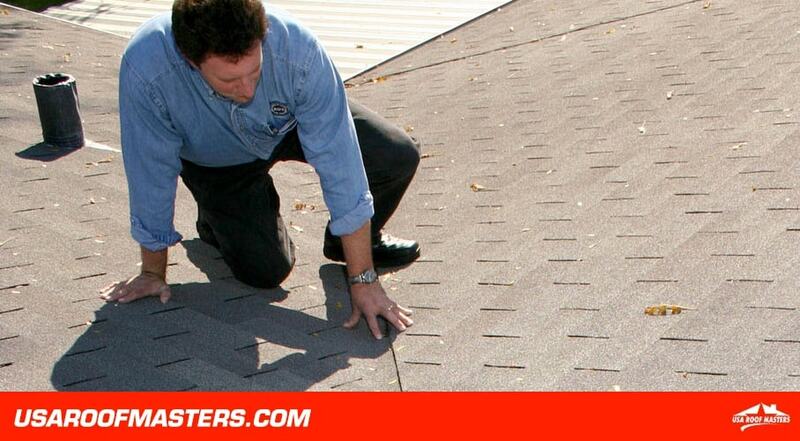 What to look for when inspecting your roof? Naturally, you should begin inspecting your roof in the attic. You definitely want to inspect water leaking and other damage signs; inspect trails and dark spots; and inspect any indication of light from the outside. Of course, you want to inspect the roof exterior of the house. You certainly want to watch out for missing or damaged shingles; you want to watch out for immense amounts of any grains of shingle in the home gutters; and you want to watch out for any signs of accumulation in moss. DID YOU KNOW: USA ROOF MASTERS MAY BE ABLE TO GET YOU A NEW ROOF FOR ONLY THE COST OF YOUR DEDUCTIBLE? If you’ve experienced storm damage of any kind that has resulted in any damage to your roof, you probably qualify. Contact Us for more info. The most typical damage with asphalt shingles comes with the aging process. In the duration of the aging, shingles can become brittle. As the granular material begins to wear and tear, you need to watch closely for warping and “bald” spots. It is certainly time to replace your shingles if you see any curling up. Typically, cedar shingle roofs can last more than 30 years, but it really depends on the regional climate you live in. You want to inspect the roofing of your home for signs of warping or dry rot. Basically, it is time to replace the roof if more than one third of it shows any sign of damage. Naturally, it is preferred to repair the roof when natural wear and tear or damage are discovered. With the technology and advancements made recently in product engineering, there is a host of state-of-the-art products on the market if you have to replace your roof. For more information on roof repair and roof maintenance, contact USA Roof Masters today by calling 267.332.0197.